Looking for a website details online is a common practice. Whether you are a programmer, an individual or, business owner, finding the website owner is the primary concern. 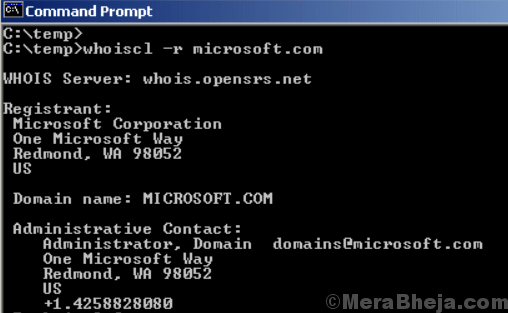 Whois is one such program that stores internet record details which helps to find out who is the owner of the domain. Hence, the name, Who-is. It stores all of the contact details related to an individual, group, or an enterprise that wants to register a domain name. Usually, the record consists of the registrant’s name and contact details and of the registrar’s. It also contains other details like the registration and expiration dates, recent updates, and more. Whois is based on either of the two data models where the details are stored – thick model and thin model. However, finding domain information online using Whois can be time-consuming and hence, a Whois lookup software can be a smarter solution. These programs not just save your time, but also help you find the exact details of a domain or IP address along with registration details of the site, and lots of other crucial details. Here we have listed some of the best free Whois lookup software to choose from. WhoisCL is another well-known Whois lookup software that’s available for free. This command line tool is lightweight and convenient that works as a great alternative to finding a domain detail online. This helps you collect accurate data related to the admin and the registrant in addition to the other tech details. The software saves a good amount of your time by not requiring any of the activities you would otherwise do online. For instance, you save time on opening the browser, browsing through the website, adding the domain name and then wait for the details to show. Therefore, it’s much faster in terms of generating results compared to the online process. It’s also super user-friendly since, all you need to do is to start the program, enter the domain name, and press the “Enter” key. It will pull up all the website related details in a jiffy. From information associated with the registry domain ID, registrar URL, name, email id or phone number to the details regarding the location, such as street, city, contact details, etc., it offers all the details. It’s a compact Whois lookup tool that helps you find comprehensive details about a website. It’s especially useful for those who want to find information related to WHOIS and DNS for a specific domain or IP address. You can also extract contact details of the domain owner. The best part is, it comes with a neat interface that comes with minimal configuration options. While there’s no guide available for support, the dedicated specifications can be easily adjusted. This will help save your time and effort that would otherwise go into the complete process. All you need to do is to simply add a working domain or IP address in the main panel, and you will have the option to get the WHOIS and the DNS details. You can also paste the details gathered from third-party programs. The software shows the IP address, network name, owner, and more details by simply tapping on the “WHOIS” option. It also shows information like the net name, address with city, country, and postal code, and more. What’s more? You can also transfer the data to the clipboard by just clicking once. Overall, it’s fast in performing a task minus errors, and also quick in generating data. If you are looking for a useful software program that’s also lightweight, WHOIS Utility could be your solution. It helps you detect IP address, domain name, and registration details of any website. Moreover, it also helps you identify the owner of the domain. SOCKS 4, SOCKS 5, and HTTPS are the proxies supported by the tool. This tool is extensively used to search databases as a query and response protocol. The software functions from the command line interpreter of your machine and come with an easy to use interface. The simple interface enables you to work peacefully. The best part is, it’s fast and so, completes tasks in much lesser time. Moreover, it also displays all the required details related to the IP address and the domain. NetToolSet is a freeware that comes with a range of benefits especially suited for network administrators. The set of tools offered by the program are carefully handpicked that helps identify the most sought-after details regarding a certain domain and IP address. This software is a complete package that scans domains and IP addresses efficiently. It comes equipped with simple some simple yet super-efficient services each of which work independently. Ping, DNS lookup, IP, or traceroute and domain WhoIs, are some of the functions that can be performed from a central administration forum. It comes with a plain and simple, yet responsive interface that serves all the options as its loaded. The utilities are neatly arranged in tabs that help you to quickly look for the option required for a task. Moreover, the tabs function separately and so, the units function independently. In fact, even the details cannot be shared among each other. While the Ping tool can help you measure the response time, Traceroute++ offers a tracer feature blended with a ping option that helps identify any problems with network usage. Whether you want to find an IP address or a domain name or use the Blacklist finder to look for hostnames, there’s a lot that it can do. Finding Whois information is a piece of cake with the IP WhoIs Lookup. It helps you detect the IP address and accordingly helps you find the website owner and their contact details. Not just that, it also populates the RIR (Regional Internet Registry) details of the IP assignee, the owner, contact, and location. In addition, it also identifies the total number of IP addresses included in the block or the number of blocks allocated to the IP address owner. The results generated by the IP WHOIS help you to identify the right person to contact in case you wish to connect to the IP address owner. You will be perhaps, presented with the ISP details assigned to the IP address owner. You can also stay safe from spammers and hackers using the abuse details in the database. When looking for the best free Whois lookup software, there can be no missing BePing. It comes with the usual ping, multi-ping, IP translation, whois lookup, traceroute, customizable data-to-ping, and more that helps you get more simple pings. The multi-ping option simply pings the number of times ensuring that it reaches an accurate average. Those looking for complete details regarding registration, domain name or owner, or IP address of the domain, can easily trust this tool. This freeware connects to Whois servers to collect all the required details along with other benefits of being a computer app. It comes with a user-friendly interface that’s also lightweight and features quite a few tools. Best of all, it does not involve any intricate installation procedure. It’s so simple that all you need to do is to enter the domain name or IP address in the search field and the website generates the results. It also generates registration details along with more details that you won’t otherwise get with a simple search. The software pulls up details like the domain name, server information, registrant data, and much more. You can find their location, address, company, or registrant ids when required. It also offers you the contact details of the registrant in case you need to contact them. What’s more? The data included in the software can be copied to the text editor. Win32Whois is another great free Whois lookup tool that helps you find detailed information regarding the domain. It generates details like domain name, domain owner, registration information, IP address, and more. The software works on Whois servers to pull up the IP address details along with the domain name. Apart from that, it also generates details like domain expiration date, address, IP block, contact information, and DNS server, and so on. Among its major features are, resumable downloads, support for transfer encoding, verification of HTTP and FTP, option to enter username/password, option to download in the absence of file size, and much more. Bulk Whois Finder is a freeware that’s simple yet efficient and that helps you get comprehensive details related to a domain and its owner. It helps you obtain the registration details, expiration dates, recently updated time, company name, and much more of the domain. It comes with an interface that works on MS Office ribbon that means all its functionalities can be easily accessed by the users. The primary window of the software is segregated into a ribbon, the category list, and the main viewing section of the data obtained. Once the scanning of the selected domains is complete, it populates all the data in a table format. This process makes it convenient for you to find the exact data you are looking for. Moreover, using the software, you can select the data columns to be displayed, manually. The best part is, you can even export the data obtained to different formats. This helps you to use the data with other programs. You can save the reports in major formats like TXT, DOC, PDF, and more. While there are many more Whois lookup tools available out there, these free tools are much more competitive. Find all the details regarding the domain and the domain owner easily with these free software and stay ahead. Axence NetTools is one of the leading Whois lookup tool that’s available for free and is perfect for both home and business users. It comes with a set of 10 useful tools that are popular across the world. These tools can be used for scanning and keeping a check on the network. Apart from the Lookup features, it also offers other features like Netwatch that tracks the response time and availability of several hosts and sends alerts whenever there is a concern with the availability of the host. The network scanner, on the other hand, detects systems connected to the network. Moreover, it also identifies all the services that are active on the discovered devices. The WinTools offer a preview of the processes and services in real-time, editor for the remote registry, details about memory, hard drives, and so on. In addition, it comes with a viewer that shows the data for the TCP and UDP services, detects custom protocols, and more. NetStat, Local Info, BandWidth, Traceroute, or NetCheck, are some of its other major features that help diagnose and monitor different aspects of the network.